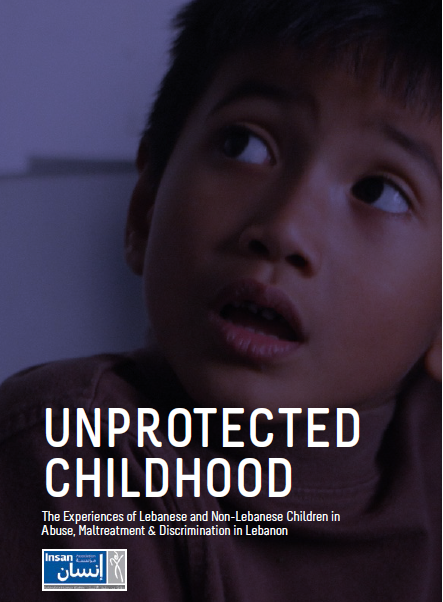 On the 10th of December 2014, on the occasion of the International Human Rights Day, Insan launched a new report examining the situation of children, both migrant and Lebanese, in Lebanon. The final report reveals the particular vulnerabilities of children of migrants to child labor, abuse and maltreatment compared to their Lebanese counterparts. Non-Lebanese children particularly refugees and those of Migrant Workers face a challenging existence in Lebanon. Violence, racist attitudes, xenophobia and discriminatory domestic policies all stand in the way of the actualisation of basic human rights for these children. Studies by Insan Association have demonstrated that, children in Lebanon and especially those of migrant workers are likely to be exposed to violence. 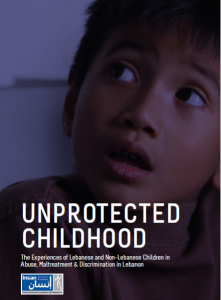 In a recent Insan report “Unprotected Childhood”, it was demonstrated that children of migrants are more likely to be subjected to neglect and sexual abuse than their Lebanese counterparts. Children are also highly vulnerable to physical abuse; there is a high prevalence of violence as a disciplinary punishment in Lebanon and a lack of clear state legislation against such practices. Various studies have shown the negative psychological and developmental consequences such abuse has on children. Non-Lebanese children tend to suffer most acutely from human rights abuses. Legal residence for non-Lebanese is difficult to obtain and makes children vulnerable to numerous infringements of their rights. For children born in Lebanon but not Lebanese, obtaining birth certificates can be a complicated and costly bureaucratic process. Without such legal documentation children face great challenges in accessing state amenities. All individuals without papers are likely to live in fear of arrest and deportation, in addition to having difficulty accessing social services like education and health-care. Health-care is particularly problematic because only Lebanese citizens can register for the National Security Fund- a low cost health-care provider. Migrants and their children are left to the whims of expensive private insurers and subsequently many go without. Discriminatory domestic policies also negatively impact non-Lebanese children. In September 2014 General Security issued a directive banning the renewal of residency permits for Migrant Workers who had children in Lebanon. In a nearly a dozen cases this meant that residency papers for female Migrant Workers and their children were not renewed. Children faced the dilemma of remaining illegally in Lebanon, thus becoming vulnerable to detention or the exploitation of unofficial labor, returning to their country of origin with their mother, or in some cases, being deported alone. Where children are deported with their mother, they suffer the loss of the family unit. Usually the father remains in Lebanon to continue work while the mother and child return. Studies have shown that children of families split in this way experience severe emotional and psychological stress. The child will furthermore be impacted by the loss of 50% of the family’s earning potential as the mother may struggle to find work in her country of origin. When the child is deported alone they face acute vulnerability. In most cases the child has rarely if ever been to their country of origin and often does not speak the mother tongue. As a result the child endures significant integration problems; they may find it problematic to pursue education or have difficulty accessing their civil rights. These issues are likely compounded by the absence of the primary caregiver. A further directive from the Ministry of Education in early 2014 set very stringent conditions on non-Lebanese children’s entry to primary and secondary schools. Lack of education severely impedes these children’s development. They will be unlikely to advance skill sets that would allow for more gainful employment and it may force children prematurely into the work-place and therefore unregulated and exploitative use of child labor. Some parents may be able to afford private schooling but must then endure the consequences of high tuition fees whilst providing for the rest of family life. For those children whose residency is dependent on their enrolment in school, the lack of education will have an impact on their legal right to remain in Lebanon. In sum Lebanon’s most vulnerable children face numerous challenges; economic, social and political. This combined with a lack of national stability, racist and discriminatory domestic policies and the precarious legal situation of most non-Lebanese, children in Lebanon face huge difficulties in achieving their most basic human rights and securities.